Outstanding, mid-height, insulated hunting, hiking, backpacking boot featuring an outstanding upper in water repellent Nubuck and a Gore-Tex® Insulated Footwear Lining to ensure maximum waterproofing and comfort. Built with innovative Crispi Technology featuring the innovative ABSS (Ankle Bone Support System), DTL (Dual Tech Lining) and CCF (Crispi® Crossbow Frame). Designed specifically to work in unison together Crispi’s Nevada Legend was designed to enable perfect stability, sustaining the foot, absorbing shock and providing absolute comfort while hunting, or backpacking in rugged hunting terrain. The Crispi Nevada Legend boot was made for comfort and the ability to “brake” in the meanest, roughest terrain that you may encounter. This is a high-end boot, designed by the artisans at Crispi to withstand miles of wear. The insole has a differentiated structure and a Crispi® Air Mesh Removable Footbed. The tough Rubber rand toe-cap and rubber heel offer additional border protection and durability. The Vibram® sole highlight the features on this remarkable boot combined with Crispi’s innovative A.B.S.S. or Ankle Bone Support System and Gore-Tex insulated comfort footwear lining. These 100% waterproof boots offer incredible support as CRISPI® 3D construction, transports moisture away leaving the foot dry and comfortable. Light on your feet the Nevada’s are always prepared for serious action “out on the mountain.” They are designed and handmade in Italy. CRISPI® BOARD LASTING – Tradition combined with Technology. The perfect connection between torsion rigidity and flexibility achieved thanks to a mechanical process that wraps the comfortable and soft part of the upper to the insole frame. CRISPI® Anatomic Fit System – Born from the concept of wrapping the foot of its full naturalness and anatomical shape, developing a sensation of immediate and long lasting comfort. The shoe becomes lighter and uniform, giving sensitivity and a better control of the foot during walking. CRISPI® Thermo Wire Technology – An innovative system developed by CRISPI® which permits to support the upper by giving extra structure, better stability, protection and support to the shoe. CRISPI® DUAL TECH LINING – When designing every single footwear item, CRISPI® pays almost fanatical attention to the dynamics of the feet while walking. Actually, it was while studying foot movements that CRISPI® has developed a new constructive technology of the inner lining that associates a kind of GORE-TEX® footwear characterized by high thermic insulation and extreme resistance to abrasion with a GORE-TEX® footwear coupled with naturally comfortable real leather. The result is 100% waterproof, breathable, long-lasting and healthy footwear products. CRISPI® WRAPPING FRAMEWORK – The W.F.W. system developed by CRISPI® is a structural over injection of a plastic polymer fused on the external part of the upper. This fusion becomes part of the shoe design. Technical Features: • Structural solidity • Lightness and comfort • Protection against external impacts • Increasing of transpiration thanks to the “Breathable areas” • Wrapping Fastening System for a perfect foot position and anatomical wrapping • Structural support on walking phase. CRISPI® CROSSBOW FRAME – C.C.F. CRISPI® Crossbow Frame brings an innovation on the shock absorbing system sole by associating the request of stability, comfort and technology in a high quality product. This insert made in plastic material follows a particular form in a waving module which offers a perfect stability, sustaining the foot and, at the same time, absorbing the shocks during the walk. Thanks to this function similar to a crossbow, this insert improves braking even in the most difficult terrains. CRISPI® A.B.S.S. – After many years of research into materials and experimentation, CRISPI® has developed a system called A.B.S.S. (Ankle Bone Support System). A.B.S.S. revolutionizes the comfort and protection of the entire ankle area thanks to a combination of innovative materials that allow the footwear to contour gently your ankle. This system offers outstanding sprain protection even on the roughest terrain whilst supporting the ankle in all conditions, thus limiting fatigue on the lower joints even after very long walks. The A.B.S.S. is a huge step forward in the manufacturing and of footwear and CRISPI® dedicates this exclusive technology development to its customers. PrimaLoft® – Primaloft insulation products offer superior performance for high quality cold- weather gear. PrimaLoft® is lightweight, breathable with excellent water repellency so you remain dry, warm and comfortable even under the most extreme conditions. 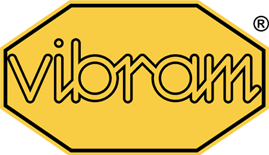 VIBRAM® – The first VIBRAM sole was launched in the market in 1937 and quickly became famous all over the world for quality, performance and safety. VIBRAM® is today a guarantee to end users and the world leader in rubber soles for outdoor boots. DRY & COMFORTABLY COOL – GORE-TEX® Extended Comfort Footwear is ideal for moderate and warmer temperature conditions. Great for high- output activities and everyday use. The technology is appropriate for constant changes between indoors and outdoors, standing and walking, working and leisure time. 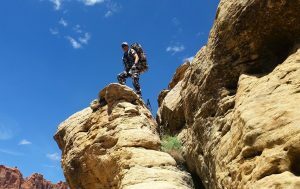 I’ve guided desert sheep hunters in high mountain plateaus and bottomless canyons from southern Utah to the rugged desert of Sonora for almost 30 years. I have also hunted sheep and other big game animals in some of them most inhospitable terrain in North America. These experiences have presented me with the privilege of spending countless days out on the mountain navigating some of the most isolated, rugged, and scenic terrain found anywhere. My choice of footwear is always paramount to my ultimate success and comfort and is without a doubt one of the most important decisions I make relative to the gear that I place my absolute trust in. The boots I wear must endure the nastiest, meanest terrain there is and protect my feet from Mother Nature’s worst conditions. I can’t remember how many boots I’ve worn out over the years or that I have personally field-tested. 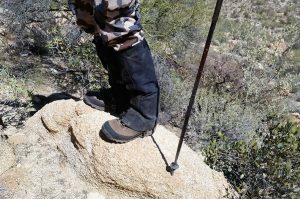 I’ve worn several different pair of Crispi boots in the past and found them to be outstanding so without hesitation, I accepted Mr. Mark Strickland’s recommendation to test Crispi’s Nevada Legend against the hunting/backpacking challenges that I had scheduled. Mark is Crispi’s new Manager for North America and is doing an absolutely outstanding job in taking care of customers! The Nevada Legend is an incredibly tough and durable mid-height (7”) boot that weighs in at just 2.0 lbs per boot. One of the first things I noticed when I slipped my feet inside was just how comfortable the Legends felt on my feet. The padded collars and rounded toe box were perfect for the shape/structure of my feet and the ABS Ankle Support system was perfect in providing additional support to my ankles. The differentiated construction of the Vibram insole featured shock absorbing “plugs” that immediately caught my attention for gripping and braking while hiking steep, uneven terrain. I was also impressed with the “rock proof” rubber heel rand and toe box rand that provided my feet with extra protection against razor sharp rocks and leather piercing cacti. For someone who spends an unbelievable amount of time out on the mountain each year, I looked forward to the opportunity of lacing up my new Crispi Nevada Legend’s and putting these boots through a field test from hell! Wow, I broke my Legends in on several sheep hunts in Sonora where the cactus and jagged rocks can raise havoc with ordinary boots. From there I tested them on an Auodad hunt in southwest Texas that had some of the nastiest volcanic, rough terrain that I have set foot in. 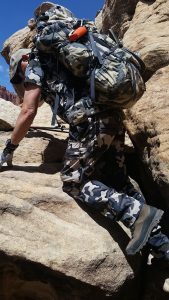 Besides those hunts I spent days traversing the broken up terrain of southern Utah scouting for sheep and looking for shed antlers. My Nevada Legends met my highest expectations. Sore feet and blisters just don’t cut it for what I do and I didn’t wear even a “hot spot” with these boots on my feet. A very positive aspect of the Nevada Legends for me was that there was absolutely no break-in time for these boots. They fit my feet perfectly as if I had been wearing them for months. Crispi uses a special constructive anatomical concept of wrapping the foot of its full naturalness and anatomical shape to develop a comfortable toe box and a sensation of immediate and long lasting comfort. The boot is light providing the necessary sensitivity while you hike and thus a better control of the foot during walking. When encountering steep inclines, the special grip on the Vibram soles of the Legend made me feel secure. I simply didn’t worry about slipping on slick or near perpendicular slabs of rock. Crispi combines three key elements in the construction of their rubber tread as the rolls are made of a special abrasive mix with rings consisting of high tech tissue that also maximizes the grip on any hiking surface. For me, that is invaluable. Tests in Crispi’s laboratory have confirmed and underscored that their soles adhere 20% greater on the ice than traditional boot soles and showed a 25% and 30% improved performance on surfaces of clay, steel, etc. The Nevada Legends tough soles and gripping action definitely won me over and seem impervious to the abrasive, grinding action of sharp lava rock and sandstone. 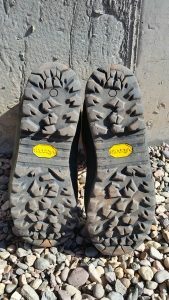 There is no doubt in my mind that Crispi has manufactured one of the most durable and comfortable boots that I have ever worn and I have field tested a lot of boots! I also had the opportunity to wear my Nevada Legends in some very mucky, wet conditions this spring in southern Utah that made me wonder whether these boots would truly stay waterproof and protect my feet from the inclement elements. I’m happy to report that they kept my feet dry and warm. Crispi’s Nubuk waterproofing and insulating qualities performed as advertised. I haven’t had the opportunity yet to test my Crispi’s in extremely hot weather but truly believe they will perform extremely well because of their breathable design. From past experience I have used Gore Tex insulated linings in warm weather and my feet have not overheated. It should be noted that Crispi does manufacture some great non-insulated boots as well. It should be noted for those who are not familiar with Crispi Boots that it is a company that has been building mountaineering boots since the early 1970’s as well as developing other product well known for quality and the latest technical design. 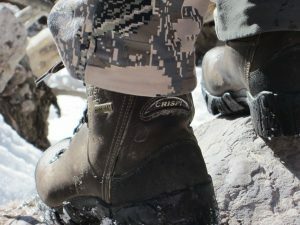 It was not until recently that they began to market their outstanding boots to hard-core hunters and backpackers. “Progress, evolution and innovation” constitute Crispi’s success, and makes them “cutting edge” and young, always in the forefront in their production sectors. HUNTING boots/products born of in-depth research regarding specific use materials such as their A.B.S.S. 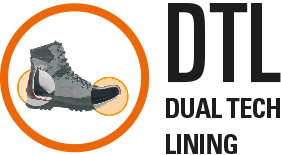 (Ankle Bone Support System), D.T.L. (Dual Tech Lining) and C.S.F. (Crispi Skeleton Frame) separate them from others in the industry. 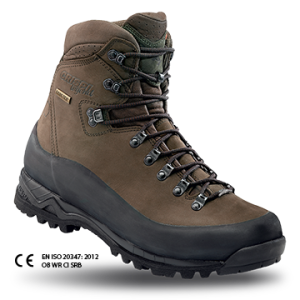 Third millennium Crispi footwear is developed with the help and advice of the best field testers from all over the world. I’m especially difficult to please and downright ornery when it comes to submitting positive boot reviews. Boots are simply one item of gear that must live up to my highest expectations to get an “A” grade. In my opinion, Crispi has developed a boot with their Nevada Legend that I would rank with the best of boots and recommend to anyone. Although expensive, (the Nevada Legend GTX’s are priced around $399,) their quality makes up for the price. When you purchase a pair of boots with your hard earned dollars you should absolutely demand and expect the boot to provide extensive durability and should be backed up by outstanding customer service. Previously, Crispi customers experienced some issues with customer service but I can assure you that their new North American Representative, Mark Strickland, based in West Valley City, Utah, stand behind his products and will take care of your needs. Regarding returns and exchanges Crispi guarantee’s satisfaction with every purchase. Returns are subject to normal usage. If their boot does not meet your expectations during its useful life, they promise to repair it, replace it, or provide you with a refund. This is very important to me. The companies that I purchase my hunting or backpacking gear from will always been very willing to take care of a problem when I phone them personally or I don’t use or recommend their products. Crispi is an outstanding boot manufacturing company as you will find that Mark Strickland and his Crispi USA team to be very service oriented, receptive and helpful. Keep up the great work guys! Mountain hunters and hard-core backpackers deserve it.